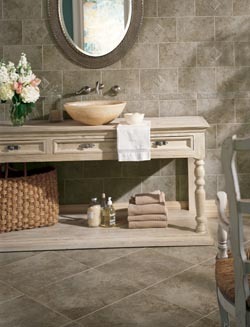 Make a statement in your home or office by choosing the multi-dimensional appeal of tile flooring. Browse our flooring store when you need to replace worn flooring or want flooring for your new home or office. With our broad selection of residential and commercial tile flooring, the possibilities are unlimited. Porcelain and ceramic tile floors are especially ideal for kitchens, bathrooms, family rooms, and offices because they are resistant to moisture, stains, and slips. In addition, they are easy to clean. There are no special chemicals required to maintain your ceramic or porcelain tile flooring, and any spots are removed by the simple stroke of a mop dabbed in a gentle cleaning mixture. If you run a busy household with active children, tile floors may be the perfect solution for you. If you’re renovating or remodeling your kitchen, patio, or even your bathrooms, ceramic tile is an excellent, durable choice for these high-traffic areas. In addition to standing up to high levels of foot traffic or even pets racing through as they play, ceramic flooring offers heightened water resistance, making it excellent in these areas that are frequently subject to rain, spilled drinks, and puddles after showering. This helps prevent mold growth, warped tile, and damage to your home or business’s subfloor. In addition to its water resistance, ceramic floors don’t crack or warp in extreme temperatures, making them perfect for use in patios, outdoor pool areas, and any area that doesn’t have climate control. Their durability means you can use them in an outdoor patio area year-round without having to worry about cracking, breaking, warping, shrinking, or expanding. Your ceramic floors are sure to look and function well for many long years to come. A favorite in bathrooms and spas everywhere, porcelain tile offers elegance, variety, protection, and long-lasting quality to any room. Porcelain is a denser, less porous, and harder option than other types of flooring, making it perfect for bathrooms and even kitchens, where there are high levels of traffic and activity. Because they’re available in virtually any appearance, color, or pattern, these floors offer a wealth of customization and design options. Whether you choose to go with one style of tile or several, your new floor is sure to impress friends, family, and other visitors to your home or business. From beauty to versatility, the benefits of slate are numerous. It’s a natural stone with unique colors and patterns, so it makes a stylish and sophisticated statement wherever it is used. Slate comes in a variety of hues, including black, green, red, purple, and gold, among others. It is strong and durable and consists of a somewhat rough finish that helps to prevent slipping. This stunning tile lasts for many years and resists damage from stains, dents, and moisture. Help keep your business costs low. Commercial tile flooring is great for high-traffic areas, as a ceramic or porcelain tile floor is a low-maintenance way to enhance the elegance of any waiting room or hallway and lasts for many long years with proper maintenance and care. Using tile floors on your business property is a strong and a smart option for medical and dental offices, where there is a constant stream of visiting patients. One of the most popular reasons people choose tile flooring for virtually any room in their home is that its maintenance is almost unbelievably easy. All it takes to keep your ceramic, porcelain, or other type of tile floor in good shape is periodic sweeping and weekly cleaning with non-abrasive cleaners and a gentle mop. Tile flooring is great for people with allergies or asthma, because it doesn’t hold onto dust, pet dander, or pollen. It simply rests on top of the tile until you wipe it away with a few swipes of a cloth or mop. This is great for businesses that see many customers, who may have various health afflictions that are aggravated by allergens or homes with children or elderly residents. Our knowledgeable associates are here to help you choose the tile floors that fit all of your needs in looks, performance, and price. We know our showroom back to front and assist you in making the best decision to suit your tastes and lifestyle. Bring us your ideas. We’re here to help you take your plans from paper to reality. Our services don't end there. Once you've picked the perfect option, we'll handle the tile flooring installation from start to finish. From measuring, cutting and installing, our experienced installers will make sure your new floors are installed perfectly the first time. We offer you complete flooring care, and provide you with a huge variety, expert advice, and professional floor tile installation. Call us or visit our showroom today to discover the possibilities. We proudly serve customers in the Webster, Clear Lake, Houston, Nassau Bay, and Sea Brook, Texas, areas.